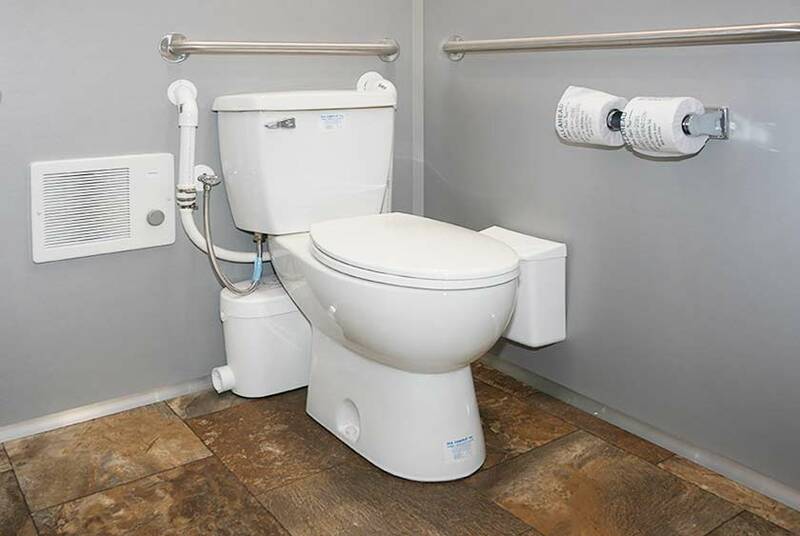 Once inside the ADA restroom, you will see there is enormous space for easy maneuverability and access to all amenities. There is a porcelain ﬂush toilet bowl with an ADA compliant ascent macerating toilet system. By the toilet seat are handrails, a double toilet paper holder, and trash receptacle. 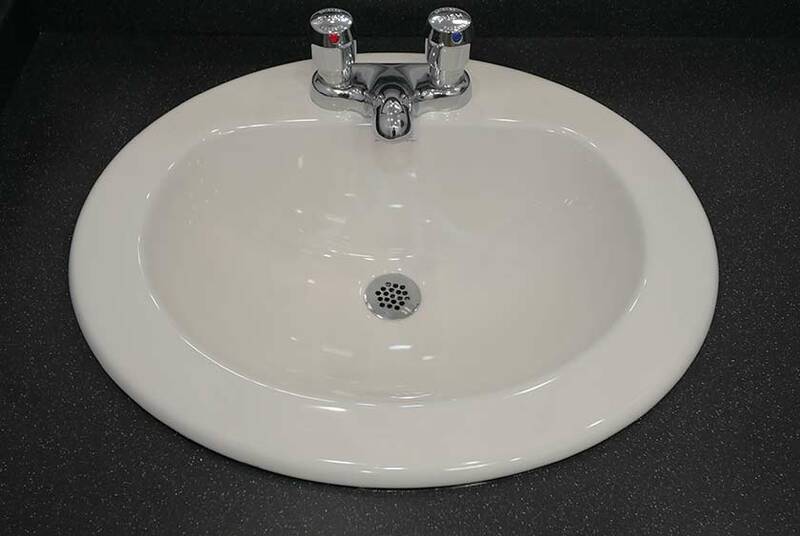 The wall hung porcelain sink has an automatic shut-off faucet with hot and cold water. 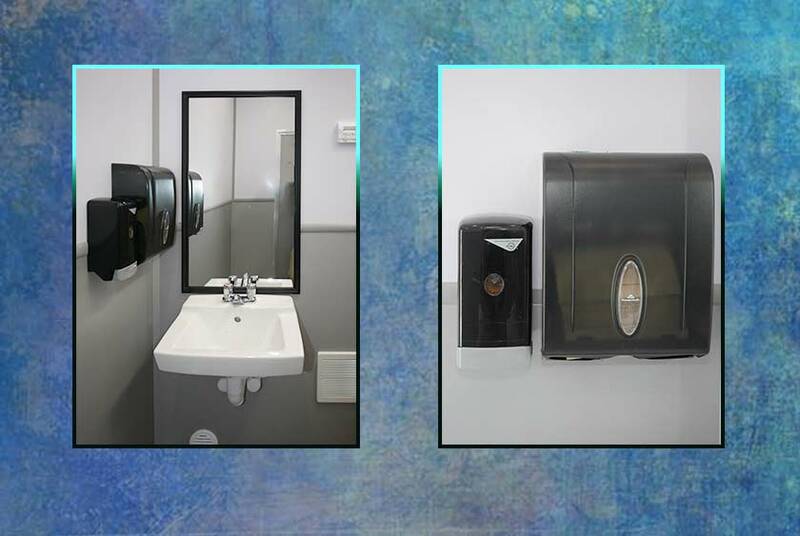 The hand towels and soap dispensers are wall mounted and easily accessible near the sink. The two additional restrooms of the HANDICAP A.D.A. 3000 Restroom Trailer are very spacious with their separate entrances. You enter each restroom via the wide ﬂoating step with a stainless steel handrail. The exterior doors display a unisex sign along with CALLAHEAD's signature signage. 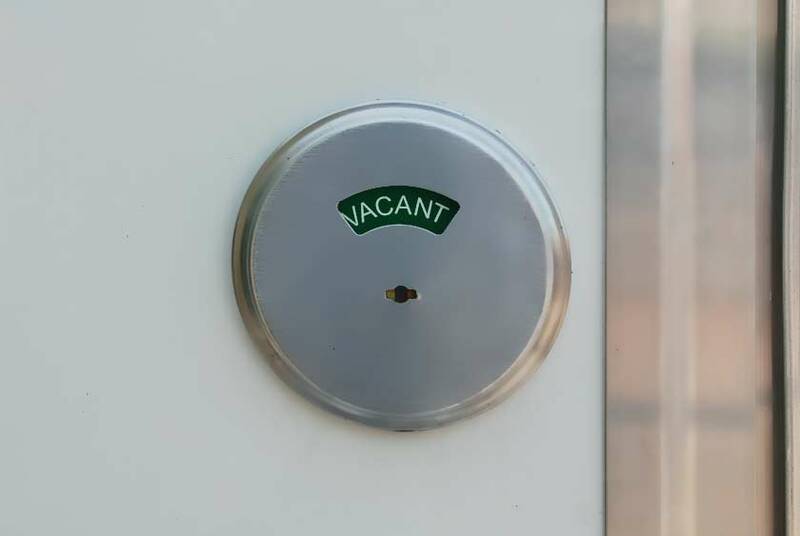 The self-closing doors lock from the inside and will trigger and exterior occupancy sign. There are a porcelain ﬂush toilet and double toilet paper holder conveniently located. The toilet bowl has a foot pedal ﬂush for easy hands-free operation. The large vanity has a porcelain sink with auto shut-off faucets and hot and cold water. 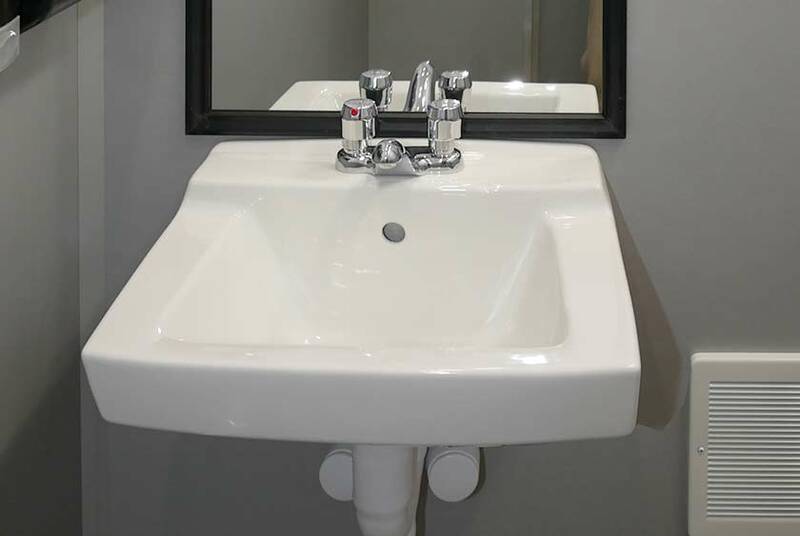 There are wall mounted soap and towel dispensers, and a mirror above the sink area. The vanity's faux granite countertop has a built-in trash receptacle to help keep the restroom clean. There is also storage beneath the sink for supplies. All three restrooms inside the HANDICAP A.D.A. 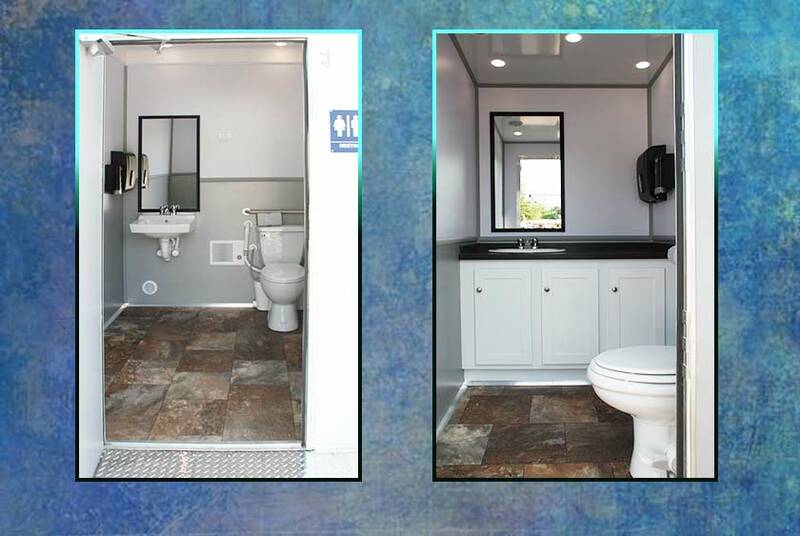 3000 Restroom Trailer are designed to offer homelike restroom comfort and cleanliness. 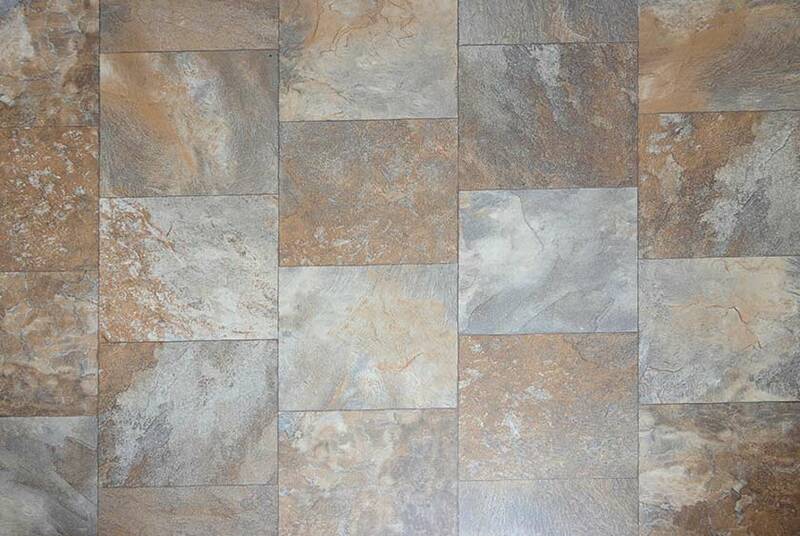 There is warm faux marble Armstrong Flooring inside all the restrooms. The Wilsonart Laminate two-tone interior walls have chair rail moldings and wipe easily clean. The HANDICAP A.D.A. 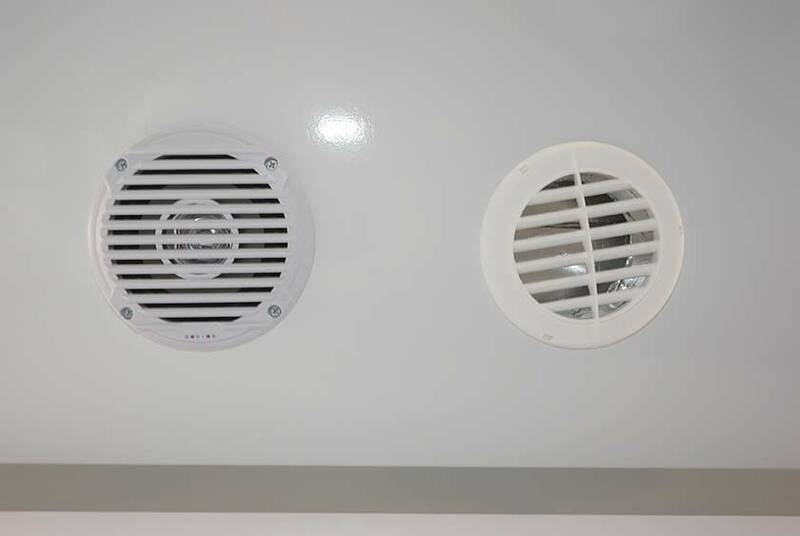 3000 Restroom Trailer is equipped with a Coleman Mach thermostat heat and air conditioning system that will provide comfort inside the restroom all year round. For New York's colder winter months there is also a fan forced heater. 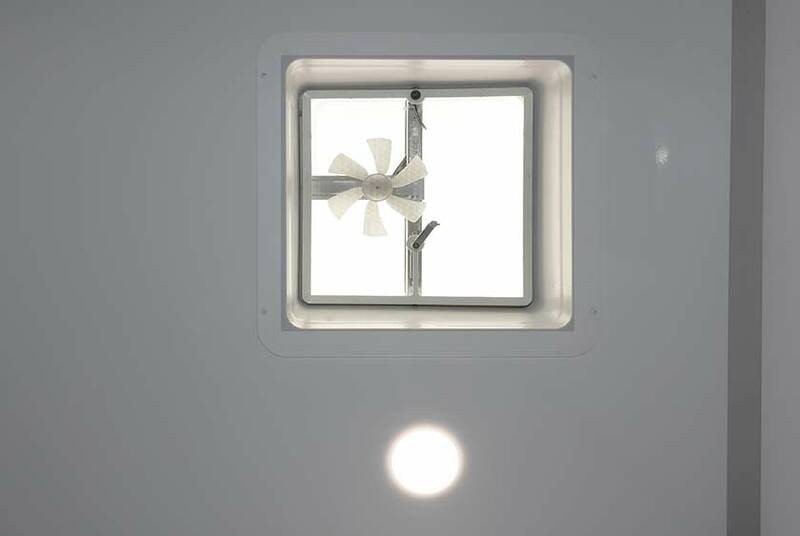 The LED high hat ceiling will provide plenty of light inside the restroom. 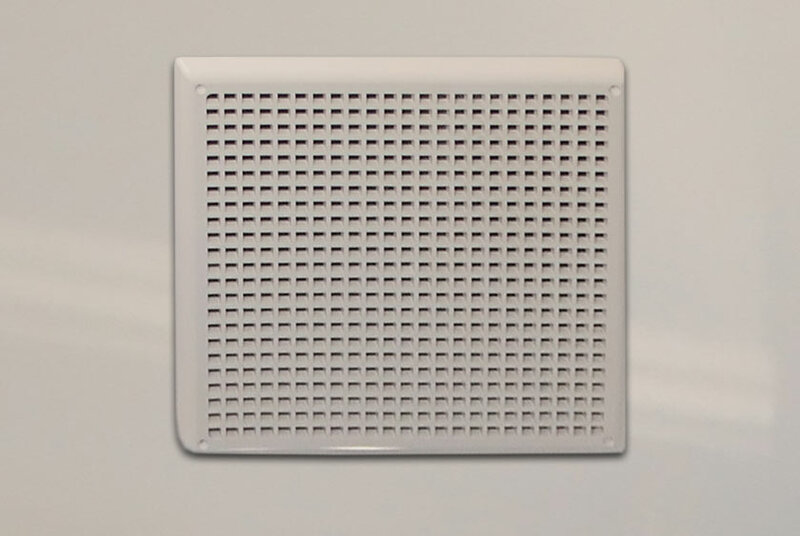 Ceiling vents are available when you want additional ventilation. For convenience, the HANDICAP A.D.A. 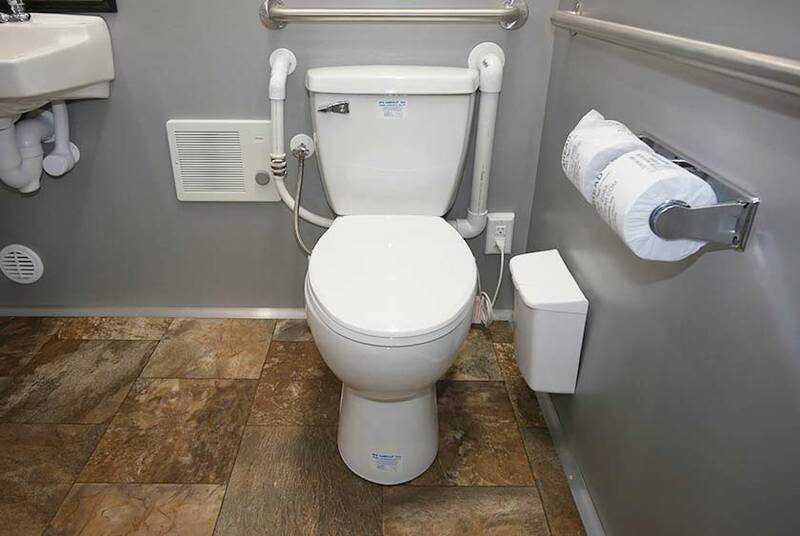 3000 Restroom Trailer runs on a generator or standard 110 Volt outlet. A CALLAHEAD professional uniformed delivery specialist will set up the HANDICAP A.D.A. 3000 Restroom Trailer at your location. Set up will take approximately 30 minutes. This is a self-contained restroom trailer with separate fresh water and wastewater holding tanks. 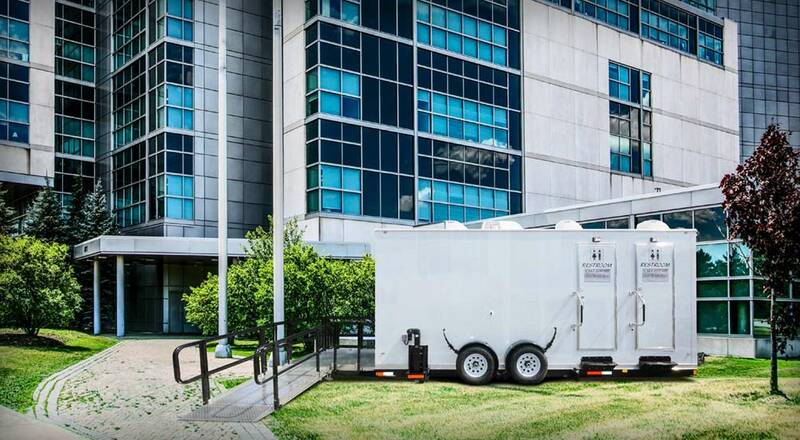 Because CALLAHEAD cleans and sanitizes all of our restrooms with only hospital grade cleaners and disinfectants, you are assured you will have the cleanest restroom trailers in the industry. As an added convenience, you may also request to have a CALLAHEAD professional uniformed restroom attendant to keep the HANDICAP A.D.A. 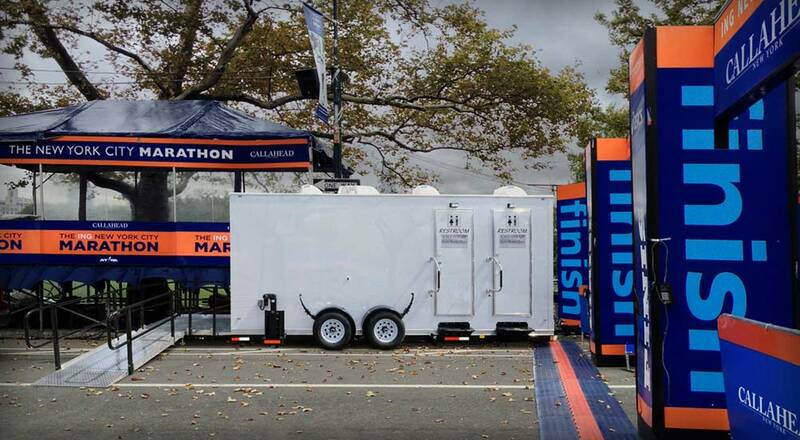 3000 Restroom Trailer in perfect sanitary condition throughout your special event. For long-term locations, CALLAHEAD also offers our hospital-grade cleaning service and re-stocking of supplies daily, weekly, monthly or tailor to your needs. The HANDICAP A.D.A. 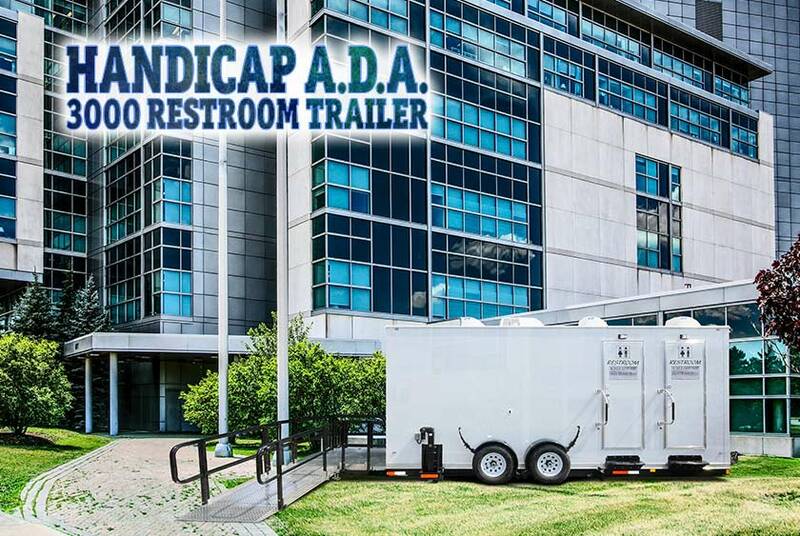 3000 Restroom Trailer is available for delivery throughout all of New York City's five boroughs of Brooklyn, Queens, Manhattan, Staten Island, and the Bronx as well as all of Westchester County, and Nassau and Suffolk Counties all the way to Montauk Point. 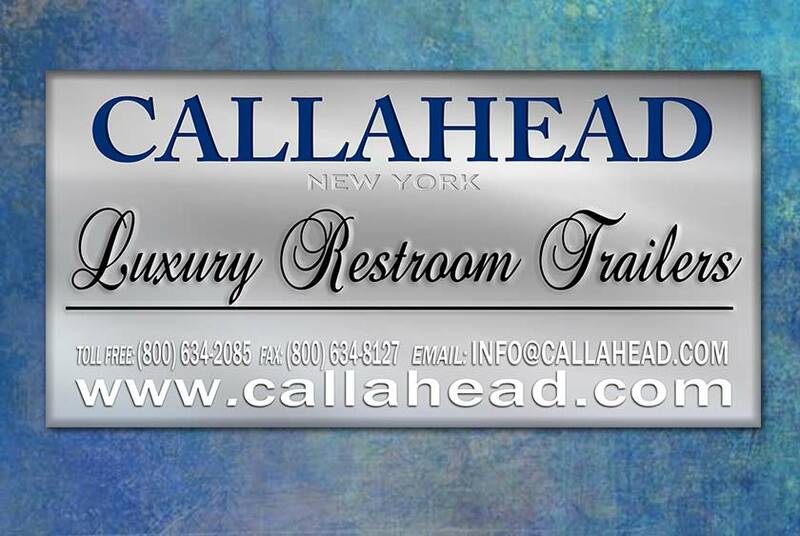 CALLAHEAD is New York's largest and most trusted portable restroom company. 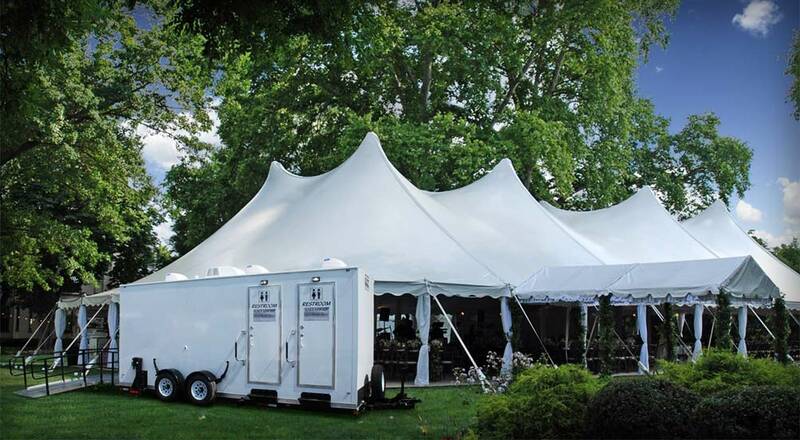 We have been in business since 1976 creating innovations to advance the portable restroom industry. "To Develop and Evolve a Human Necessity" is not only CALLAHEAD's mission statement it is our life's work. 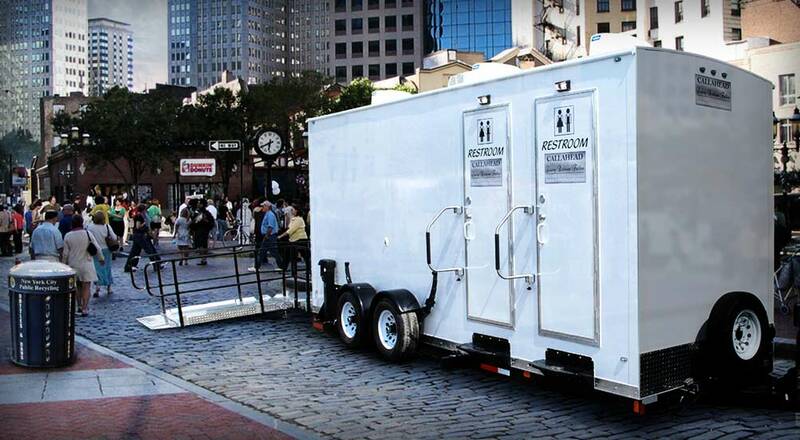 Let CALLAHEAD deliver the world's best portable restroom experience for you. For more information about the HANDICAP A.D.A. 3000 RESTROOM TRAILER or any of CALLAHEAD's luxury restroom trailers, construction restroom trailers, VIP portable toilets, standard portable toilets, porcelain toilet systems for office trailers, security guard booths, holding tanks, fresh water delivery, commercial portable sinks, portable hand washing sinks, antibacterial and hand sanitizing dispensers, long-term or short-term portable toilet rentals, long-term or short-term restroom trailer rentals, portable shower rentals, and portable storage shed rentals, please contact one of our expert sales specialists at 800-634-2085 or visit our website for photos, videos and details at www.callahead.com. For added convenience, we are proud to offer the below list of optional accessory items for your HANDICAP A.D.A. 3000 Restroom Trailer rental. 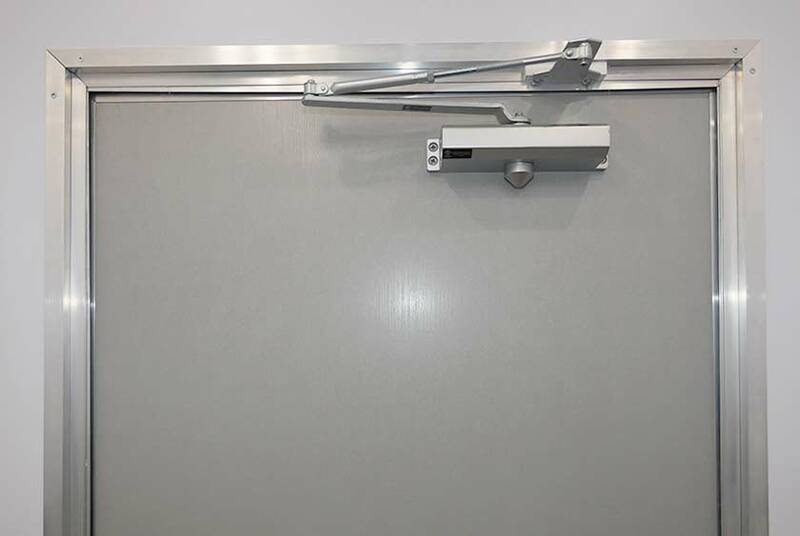 All of CALLAHEAD's rental accessories for restroom trailers were selected to provide the same comforts and hygienic protection of a homelike restroom experience. 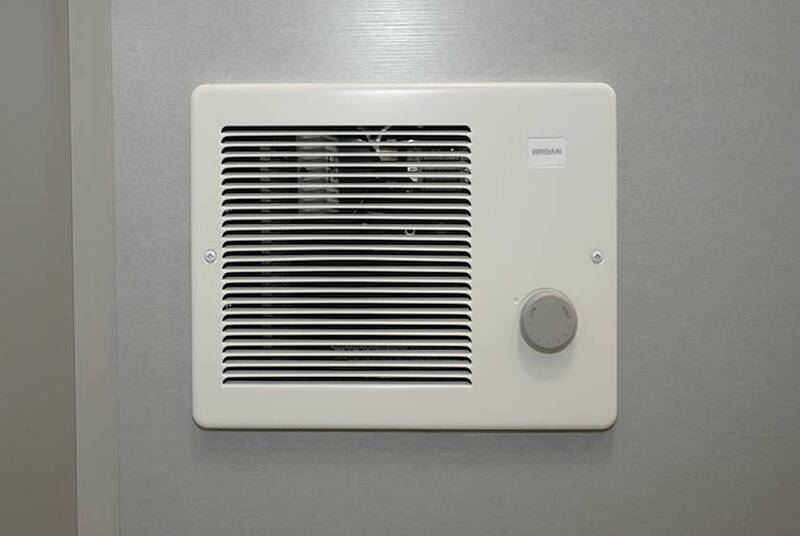 • Headliner Toilet Seat Cover Dispenser is installed inside each stall of the HANDICAP A.D.A. 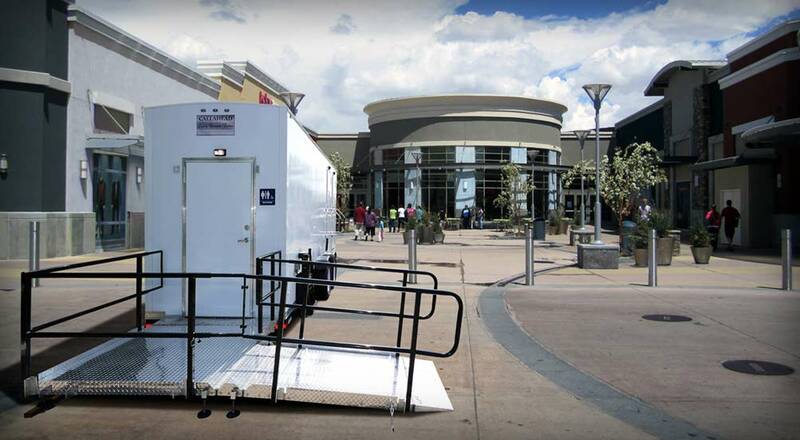 3000 Restroom Trailer, filled with 250 toilet seat covers so every user may have a clean, dry and sanitary toilet seat. • Headmist Time Released Air Freshener is installed in the HANDICAP A.D.A. 3000 Restroom Trailer that will release a fresh, clean scent automatically. • Professional Hospital Grade Cleaning Service is available daily, weekly, monthly or a cleaning service tailored to your needs. 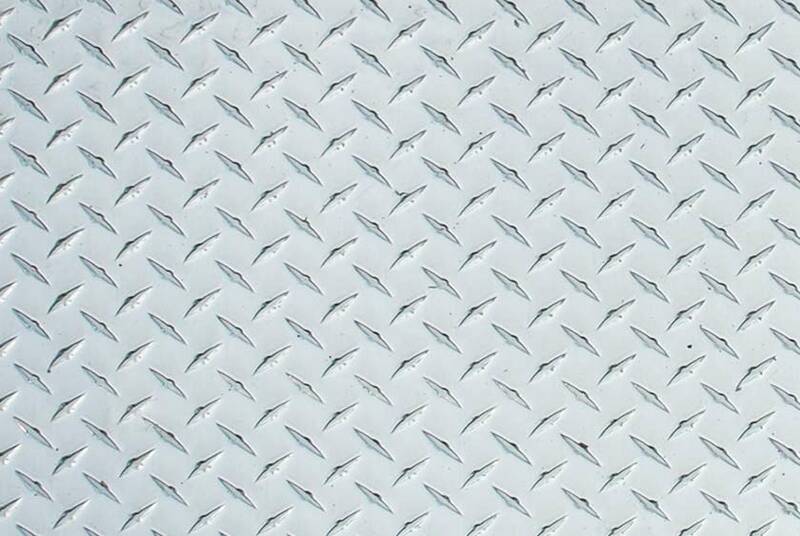 Our professional uniformed service technician will clean, service and re stock all amenities at every service. The HANDICAP A.D.A. 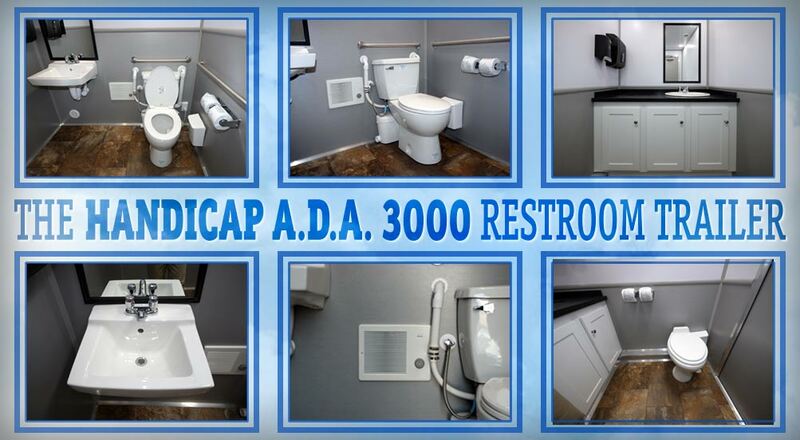 3000 Restroom Trailer is for any long-term and short-term rental in need of ADA compliant bathrooms. The HANDICAP A.D.A. 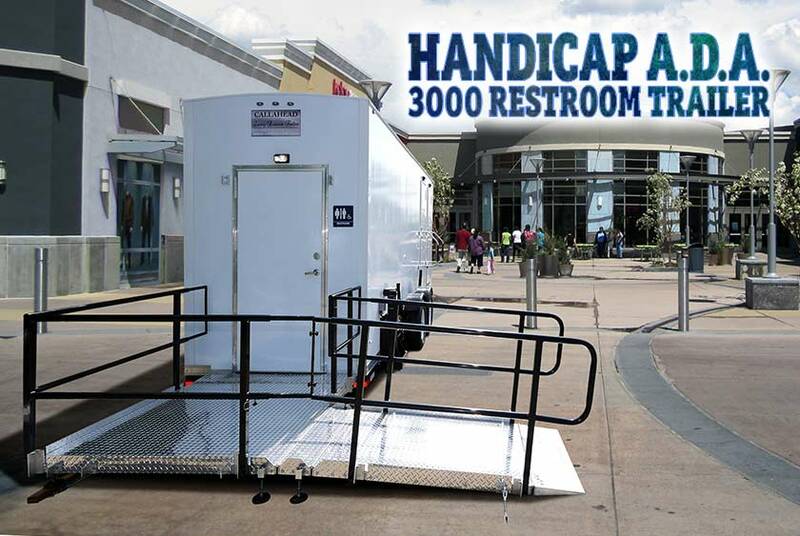 3000 is a CALLAHEAD restroom trailer that supplies a certified ADA wheelchair accessible restroom plus two additional private bathroom facilities. 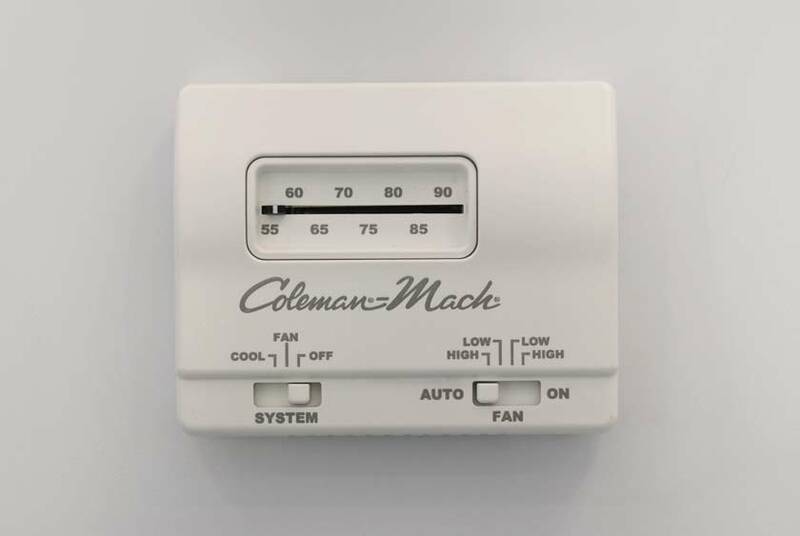 It is equipped with thermostat heat and air conditioning as well a home-like design to deliver user comfort, cleanliness, and privacy. The HANDICAP A.D.A. 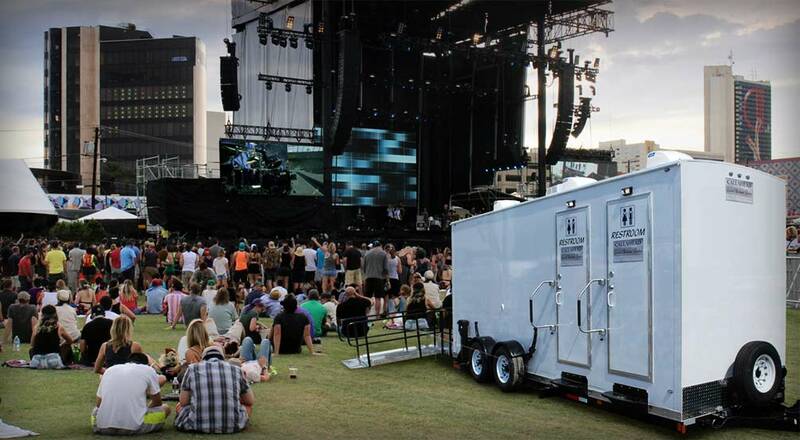 3000 Restroom Trailer is a popular rental for special events and businesses alike. 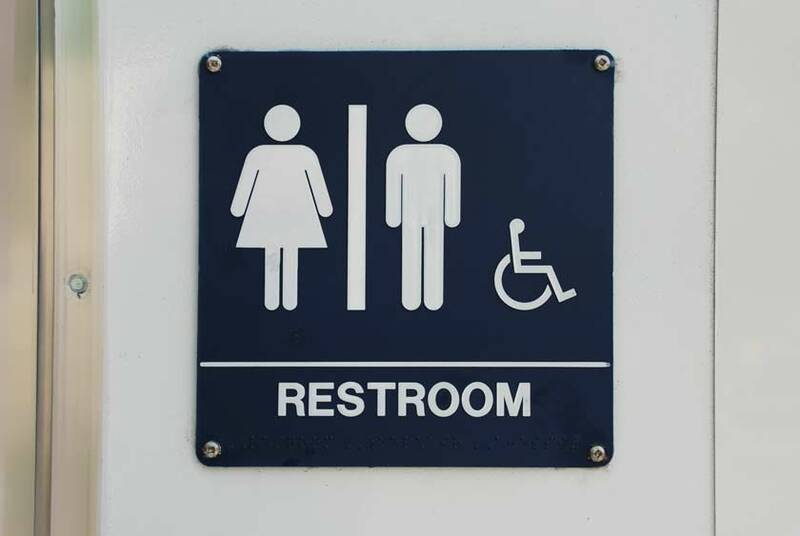 It is also necessary for long-term rental locations such as a shopping center or for business bathroom renovations or any public venue that require ADA compliant bathroom facilities. Each of the three private restrooms includes all the amenities necessary for a sanitary trip to the restroom. The HANDICAP A.D.A. 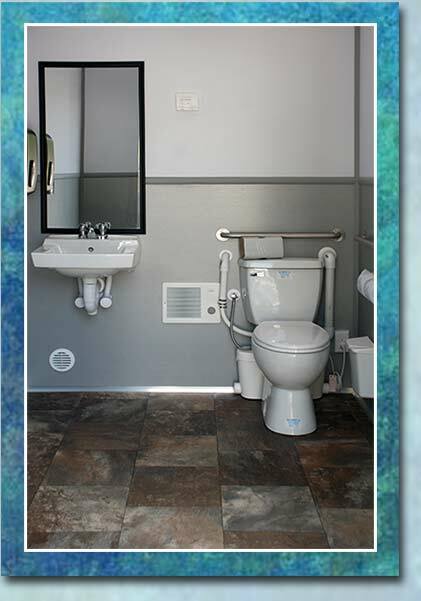 3000 is designed with one of the restrooms specifically for disabled users and guests who require additional assistance. This is also an excellent family restroom for parents caring for small children or older adults that require assistance. The HANDICAP A.D.A. 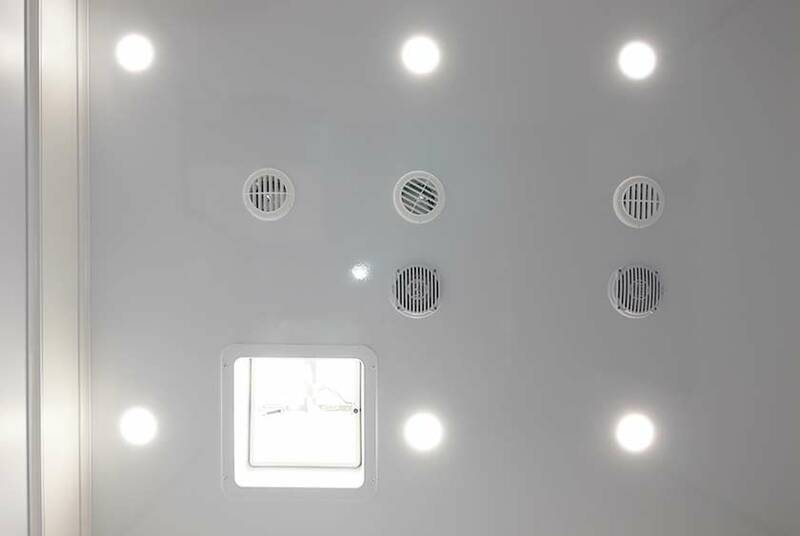 3000 Restroom Trailer has a bright white exterior and outdoor lighting for evening use. All private restrooms are unisex, have separate entrances, and an interior lock that triggers an exterior occupancy sign for privacy. The extra-large ADA compliant restroom of the HANDICAP A.D.A. 3000 has a wheelchair ramp entrance with handrails. The very spacious 60" x 60" deck entrance leads to an extra wide self-closing entry door with an interior lock.